For the creation of a stunning piece of 21st century architecture from one of the worlds most celebrated architects careful specification of materials was required. With their proven reputation, high performance door closers from DORMA were chosen for the new £36 million Evelyn Grace Academy in Brixton, the first completed project in England to be designed by renowned architect Zaha Hadid. Built by international consultancy and construction company Mace, for owner Ark Education, the new build 1,200 pupil academy comprises approximately 11,000m2 of floor space which has been cleverly and seamlessly divided into four small schools so that children will not be overwhelmed by the large building. 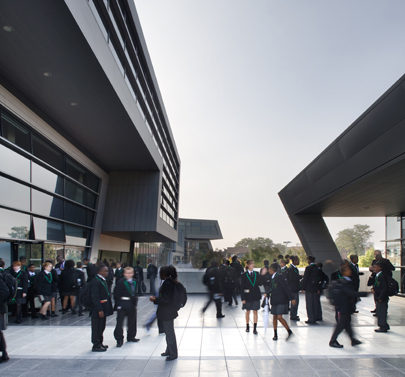 Complete with a 100 metre running track stretching through its centre, this visionary project was designed to provide state of the art learning facilities in a contemporary environment. When it came to the specification of the doors in the lobby area and the significant number of internal fire doors, DORMAs TS92 cam action door closers and BTS80 EMB electro-magnetic door closers proved the ideal solution. With their compact and elegant design, they matched the modern vision of the academy. Safe, reliable and robust, they are also ideal for heavily trafficked educational projects. Architectural ironmongers, Harbrine, worked closely with Zaha Hadid to ensure that the most suitable door closers were specified for the project. In total, DORMA provided 28 of its TS92 satin stainless steel cam action door closers in its stylish Contur design and also 2 BTS80 EMB Electro-Magnetic Hold Open Floor Springs. DORMAs TS92 cam action door closers were used on the buildings internal fire doors. Suitable for doors up to a maximum width of 1,100mm they are the perfect choice for use on internal doors with regular to heavy footfall. The DORMA TS92 cam action door closers fit perfectly into virtually any interior design, thanks largely to the systems unrivalled adaptability in assembly to the door and an inconspicuous, subtle appearance. The companys BTS80 EMB electro-magnetic floor springs feature in the lobby of this prestigious school. These floor springs allow the doors to be held open easing the flow of traffic, yet, they are connected to the fire alarm to ensure they close in case of emergency. A comprehensive programme of accessories ensures that they can be used successfully with a wide variety of door constructions and floor coverings. CERTIFIRE approved, DORMAs TS92 cam action door closers and BTS80 EMB floor springs both meet the requirements of BS EN 1154 Code of Practice and the requirements of The Special Education Needs &Disability Act (SENDA) to remove the physical barriers that prevent people with disabilities from accessing a service. With the project now complete, the stylish door closers further enhance the buildings stunning contemporary aesthetic. Thanks to the high quality, superior performance range of products provided by DORMA, Evelyn Grace Academy provides safe, smooth and reliable access to its students, staff and visitors.